Natural disasters landslides occurred on the 16th kilometer, the path connecting Denpasar and Buleleng regency. 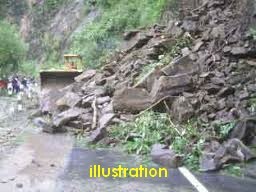 Landslides caused by continuous rains in Bali from yesterday until today, February 20, 2013. It rained almost flushed all over Bali. Heavy rains occurred in a mountainous area in the village of Gitgit. Gitgit mostly clove plantation area. Pathways connecting Denpasar with Buleleng is a mountainous hills and cliffs that is very prone to landslides. In natural disasters Gitgit landslide in the village, two people were found dead, and the main route connecting the north and south Bali Bali paralyzed. Long traffic jams ensued at this point. Related to the two killed were identified named Gede Merta (35), and Gede Muliawan (27) local residents. The accident occurred when the victims with local residents was cleaning barrow covering the main line was. However, he said, a sudden landslides aftershock struck the two young men Gitgit it. Both residents were hit by an avalanche Buleleng resistant from a height of 10 meters. Both bodies were found buried in a ravine along the highway. Currently, the corpse is still in the stage of advanced evacuation at a local hospital.